The Arizona Registrar of Contractors, or ROC, oversees the licensing and regulation of contractors in the state, from roofers to plumbers to general contractors. The agency’s goal is to promote quality construction and to protect the health, safety, and welfare of the public. If you are searching for a roofing contractor in Glendale to hire, you should always check out the ROC’s website to verify the contractor’s license, to search for any complaints filed against the contractor, and to get more information about how to handle the hiring process. The Arizona ROC not only issues licenses to contractors, but it also classifies those licenses so that it is clear what type of work the contractor is authorized to do. The ROC has an extensive list of license classes that are broken down by letter and number, organizing contractors by fields like engineering and roofing and by job types like residential and commercial. Roofers are generally classified CR-42, which gives them the right to work on residential and commercial roofing projects. With this license classification, they are able to repair or install Glendale shingle roofing, tile roofing in Glendale, shake, slate, foam and metal roofing. They can also apply roof insulation and coatings. If contractors try to do business in Arizona without a license, the ROC will penalize them. To start, if a roofing contractor even bids on a project worth more than $1,000 without having a license, the ROC will refuse to grant a license to that contractor for one full year from the date of the bid. That person won’t even have the opportunity to do legitimate business in the state for some time. If a person continues to do business without a license or takes advantage of property owners, the ROC may include the contractor on its “Most Wanted” list on its website. This list tells property owners the contractors to avoid, and it includes a photo of the contractors, their aliases, places they have worked and other details. The ROC does everything it can to ensure that these people are found and that property owners do not do business with them. You can file a complaint with the ROC if a contractor performs substandard work, acts unprofessionally, takes your money, or commits some other violation. You just need to go the website and choose “file a complaint.” You will be asked to describe what happened and to attach any documentation you have, such as a contract, invoices, business cards, receipts, advertisements, or permits. You are asked not to include photos or plans since an investigator will take photos during an on-site inspection. If an inspector finds that the work was performed to minimum industry standards, your complaint will be dismissed. If the work was not performed to minimum standards, a written directive may be issued for the work to be corrected within 15 days. If the contractor fails to act, legal action may be taken. The ROC does important work to protect the public, but you have to make smart decisions to protect yourself, as well. The best decision you can make is to only work with contractors who are licensed and fully insured. If a contractor is not licensed, you have no way of knowing if the person has the right training and experience to perform high-quality work. You will also have little recourse if the person performs shoddy work or takes off with your money. If a contractor is not fully insured, you are putting yourself at risk of major financial losses if there is an accident on the job site. A mistake can cause significant damage to your home and/or result in major injury to you or your family members. Without a contractor’s insurance, you will be left to pay for those things yourself. You can check the ROC’s website to verify a contractor’s license and whether it is current. Always verify these credentials and check to see if there are any complaints against the contractor on the ROC’s website. If you do have any problems with your roofing contractor, work with the ROC to resolve the issue. 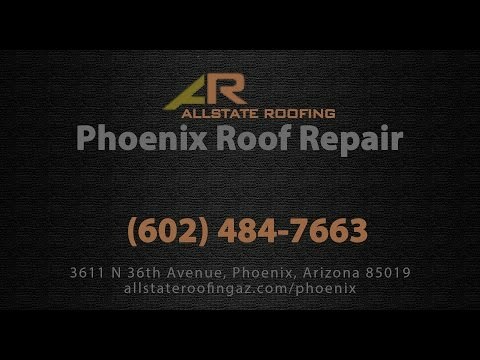 Allstate Roofing is a fully licensed and insured roofing company in Arizona. Our roofers perform everything from the basic roof repair to complete re-roofing. No matter the job, they put in the same attention to detail to produce the finest results. We are committed to superior workmanship and service, which has made us one of the most respected roofing companies in Arizona. Visit our site to learn more, or call us for a free estimate on your roof repair or re-roofing job.